The expansion, which will include a structure for cremated remains, is in a space already slated for use as graves. For every person living in Portland today there is another resting in a city cemetery that’s as popular as a park as it is as a burial ground. But soon the living who enjoy Evergreen Cemetery on Stevens Avenue will have to make a little more room for the dead. 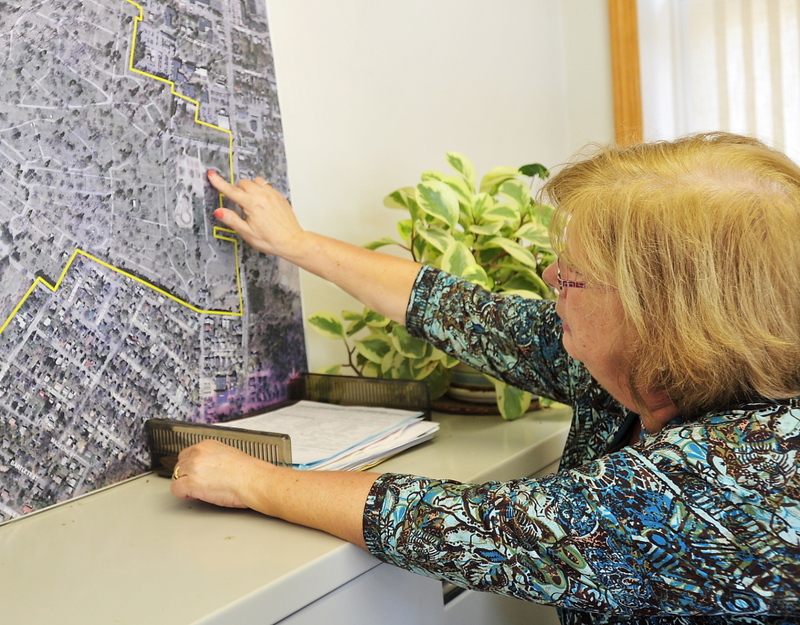 Elaine Spring, administrative associate for the Department of Public Services, shows the area that Evergreen Cemetery is expanding to allow more cemetery plots to be sold. 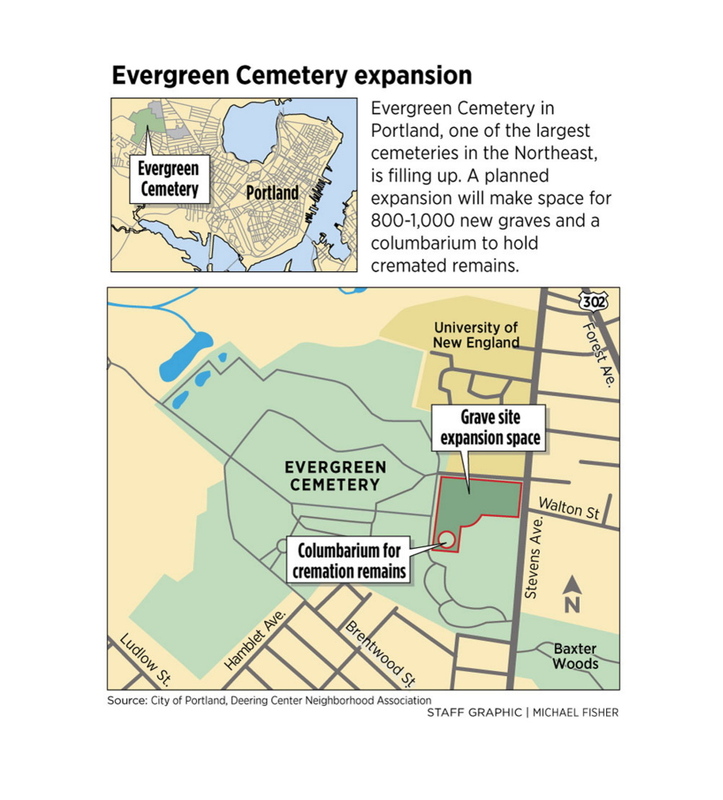 Faced with the possibility of running out of burial space within the year, Evergreen’s overseers are planning to add 800 to 1,000 graves near the main entrance as the cemetery continues its steady expansion. Plans also call for bringing the historic cemetery into the modern funerary age by adding a stone structure – known as a columbarium – where cremated remains can be laid to rest above ground. “Any cemetery of this size anywhere in the country has had a columbarium for a long time,” said Joe Dumais, superintendent of cemeteries for the city of Portland. Dumais and other city officials will discuss the expansion plans and hear feedback from the public during a meeting from 6:30 to 8 p.m. Tuesday at the cemetery’s Wilde Memorial Chapel. At 239 acres, Evergreen is Maine’s largest cemetery and one of two owned by the city of Portland where interments still take place. Incomplete record-keeping from the cemetery’s early years beginning in the mid-1850s make an exact count impossible, but Dumais said between 60,000 and 70,000 people are buried in Evergreen. Portlanders also regard it as a favorite recreation destination because of the cemetery’s rolling terrain, tree-lined or wooded trails and ponds. Less than half of the 239 acres is reserved for burials. The fact that Evergreen is filled with classic examples of skilled stone masonry as well as many famous names from Portland history draw others to the sprawling graveyard. Among the notables buried in Evergreen are former U.S. Speaker of the House Thomas Brackett Reed, who in the late 1800s strengthened the role of the House speaker and the majority party in ways still visible today; former Gov. Percival Baxter, who single-handedly created Baxter State Park; and Sen. William Pitt Fessenden, who served as Abraham Lincoln’s treasury secretary during the Civil War. The planned expansion area is an L-shaped section adjacent to the main entrance road off Stevens Avenue and near the cemetery’s administrative buildings. The area already has some grave sites as well as roads and gravel pathways, as laid out in the first phase of the expansion project begun in 2006. The proposal calls for modifying several of those roads and the layout for new graves. The columbarium will be built on a circular mound that is already surrounded by a road and will feature 300 “niches,” each of which can accommodate either one or two urns of cremated remains. Between 100 and 130 people are interred at Evergreen each year. Dumais said about 52 percent of those have been cremated in recent years, reflecting the national trend. While the cemetery has a “cremation garden,” many people choose a traditional grave site that can accommodate two cremated remains or one casket burial and one cremation. The columbarium offers another option as Maine – already home to the nation’s oldest population – faces higher death rates with the aging baby boomers. “That is the main reason we are adding the columbarium,” Dumais said. “Because right now we have very few options. The columbarium is a very popular way” for final rest. On a recent afternoon, there were more people walking dogs, jogging or strolling the trails of Evergreen Cemetery than there were paying their respects to anyone buried there. Among them were Jo-Ana Debeau and her 3-year-old daughter, Julia Brown, who come to Evergreen frequently. The pair were feeding ducks at the pond (with Julia also keeping sea gulls at bay with a highly effective sprint-and-shriek approach) and looking for aquatic critters. Julia’s father and brother were exploring an adjacent pond.